Fireplaces are natural gathering areas in the home. Whether they actually function or not, fireplaces instantly evoke feelings of cozying up, relaxing, and coming together, especially as the winter weather descends upon us. If your fireplace is currently underused (or completely unused), consider making over this space; it can quickly and easily become one of the favorite spaces in your house. To begin with, don’t feel hemmed in by the original state of your fireplace. 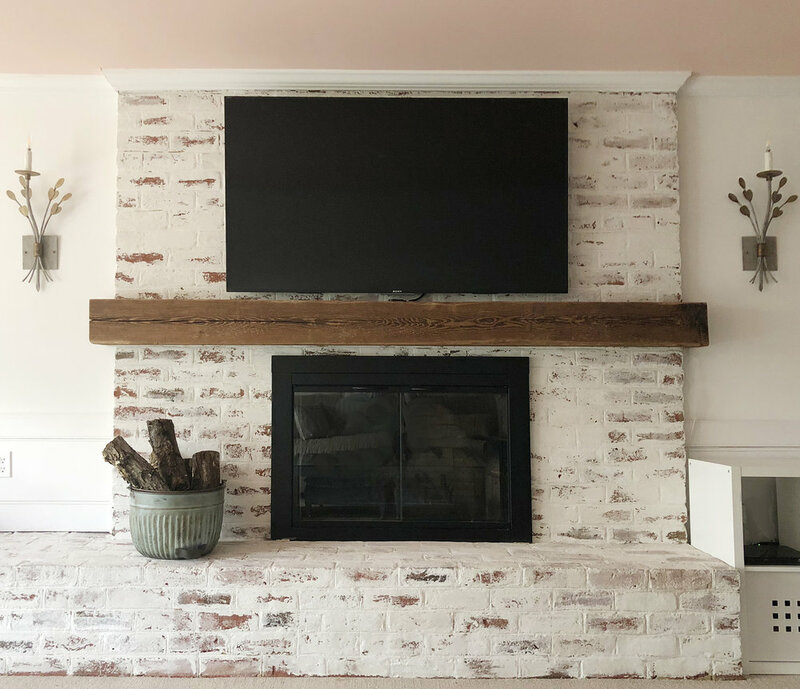 We transformed the feel of one client’s room by revamping their brick fireplace with a wash of white mortar. Depending on the material you choose for the fireplace surroundings, that room will take on a classic, sleek, or whimsical vibe. Even a small aesthetic touch can make a large statement if you aren’t prepared to make a large change. For example, black or gray concrete fireballs are a chic, modern fireplace alternative to more traditional logs. If you are living in a space that lacks a working chimney, you can still bring warmth and comfort to your home via a ventless gas or electric insert. Non-functioning fireplaces can still serve the primary purpose of spreading some light. Buy white birch logs and stack them with ends facing out as an alternative. The whiteness of the logs helps to evoke the sensation of a light-giving fire. Or fill the fireplace cavity with white candles of varying heights. Focusing on one color for the candles yet including different sizes helps the space avoid the look of a candle storage bin. Or get playful: stacked books will also help cultivate cozy feelings and is a much more timeless display than BluRay discs or DVDs. As much attention as you pay to the inside of the fireplace, make sure to give what’s above it some consideration as well. One simple fix is to add a mantel over the fireplace itself as we did in a client’s home. This surface can serve as much more than a space to store favorite photos, vases, or holiday décor; it’s an opportunity to subtly draw attention to other personal style preferences. For example, the large picture featuring an exotic bird creates a main focal point, while the small orchids add color and livelihood as well as an organic shape. The tall, linear candles balance out the mantelpiece display and add length. The result is a clean and serene mantel that reflects the interests and personalities of the room’s owners. Your best bet for an organized, visually impactful mantel: choose one main element to concentrate on and then add just a few components that complement it.